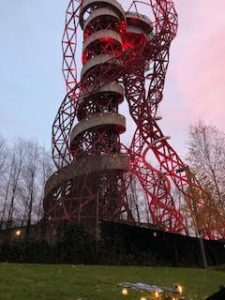 Marion Briggs and I with ten others had a wonderful Solistice event near the main Olympic stadium and the Hanish Kapoor vortex sculpture. Our doing this event originated from Hanne’s workshop on 2nd December, and is a fitting pivot or spinning point between the Wheel of Life 2017 and our new one 2018. 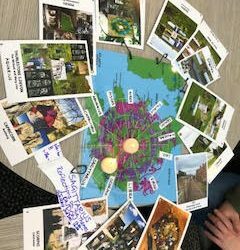 I brought along the landscape zodiac map with the attached collage photos by Charlotte of our 2017 Wheel of Life events throughout England, Wales and the Isle of Man. I attach some photos and will put them and others in Dropbox for Charlotte to collage. I did ask people who didn’t want to be in the photos to stand away. All in all, we can celebrate our first Wheel of Life year with events in each Landscape Zodiac section, and including new people in our events. We can build on this momentum in 2018, finding ways to publicise our events. Perhaps there is a way we can make interconnecting wheels of Life that link Scotland and Ireland. We’ve activated and connected with energy in our first Wheel of Life. Please note this quote by Marion, who by the way, did research with Louise Coe, Anthony Thorley, Peter Dawkins and others for the 2012 Olympic Games preparation book, ‘Legendary London and the Spirit of Place: New Light on the Great Changes of Our Times’. It’s quite over- and in-whelming, a new phrase I just made up, to be conscious of and in our Wheel of Life, take part in this cosmic alignment. Best wishes for a peaceful and aligning holidays, joy in our spirit together.